OmniMount adopts modular approach for new Link Series | What Hi-Fi? There are four units in the range – the LT63, LDC31, LC31 and LS31 – that combine to create a single piece of furniture for your TV and home entertainment system. They're all finished in black gloss, with black glass and brushed nickel supports. 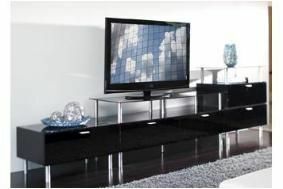 The key part of the range is the £659.99 LT63, a combined table and cabinet that accommodates TV screens up to 65in. It has two enclosed cabinets to provide concealed storage for audio and video components, as well as an open shelf for additonal items. To accommodate larger systems, the Link Series LC31 and LS31 can be added. The £289.99 LC31 is a stackable cabinet in the same finish as the LT63, and it has removable legs so it can stand on the floor or be placed on top of another unit. The £79.99 LS31 is a shelf with black glass and brushed nickel legs, capable of supporting equipment weighing up to 23Kg, and completing the quartet is the £579.99 LDC31 with two enclosed cabinets, one above the other.